It’s time! 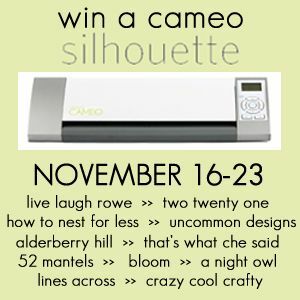 This Silhouette Cameo could be YOURS! Your crafting possibilities are endless. We thought we’d provide you with links to some of our projects to create some excitement and get those creative juices flowing. If you don’t win — you could always ask Santa to bring you one for Christmas, right? May you find inspiration and excitement. I would totally have to keep it!! I would absolutely keep it! I’ve wanted one for a long time. Yep, it’s a keeper! I might possibly let friends borrow…if they were very good…and brought cookies! I have been wanting one for a while now so I would be thrilled to keep it and use it. I think I would keep it. But I would have to make lots of gifts for others using it! I’ve been wanting one for the longest time. I would definitely KEEP IT! I would most definitely keep it and I don’t even know what it is YET! I would sooooo keep this! I having been dying for one, but my budget never seems to allow me to get one! This is my one and only item on my Christmas list this year…so I would absolutely keep it! Have been dreaming about one all year!! I would have to keep it! I have been wanting one for a while! I would definitely keep it! I don’t have one and I read all of these blogs that post projects that they’ve made with it! I’m inspired and want to create something too! I would keep it so I could make multiple gifts!! I would totally keep it!! I have a Silhouette SD and have been wanting to upgrade!!! If I were to win, this baby is all mine. To many gifts to make for people! I have so many things to cut… and my “other” machine is acting more like a horror flick character than an expert crafter. To win this would be my holiday dream come true! I would keep it! I have always wanted one!! I would love to have a silhouette cameo! Think I would probably keep it for myself. I see all the projects on the diff blogs that can be done with it and it just gets my creativity roaring. Thanks for opportunity to win one! I want one of those so bad! I would love to win one! I would keep this one & give my original to my daughter. Thanks so much for the giveaway & a chance to win. No doubt, i would keep it. This would definately brighten up my holiday. I would love to have a Silhouette! Definitely Keep It! I would love to win the Silhouette and give it to my daughter. I’d keep it and give my SD to someone. I have been dreaming of owning one of these! I would keep it. Keep it – yeah selfish like that…. Well, I would love to come across as altruistic, but truthfully? I would keep the Silhouette because I have been wanting a vinyl cutter for freaking forever and been unable to afford one! So yeah…Keepin’ it if I win! Thanks for the great giveaway! I would definitely keep it!!!! I’ve been dying for a Cameo for ages. I would definitely keep it! I would keep it! Everyone keeps saying how great they are! I sure would love to try it out on crafting and scrapbooking! I would so keep it!!! Yes it is selfish but I would share it as much as possible. Of course I would keep it! Super cool! I would keep it, I’ve had it on my wishlist since it came out. Keep it but make lots of gifts for other people! I would say I was going to gift it, but then I would totally rationalize why I should keep it! It’s a keeper for sure! I just keep thinking about all of the things I could make for my home and classroom. Oh, the possibilities! I am a pre-school teacher and have a 1st grade Camp Fire group, I am always looking for ways to make both shine!! You bet your britches I am keeping this!!! I’d have to keep it, since it’s the one gift on my Christmas list. My husband would be almost as thrilled as me!! It would so be mine to keep! I would gift it! I already have one and love it! I would definately keep it! At this moment I plan on keeping it. Thanks for the chance. I’m hoping to own one by Monday. I would love to win the giveaway for myself and use that money for someone else’s Christmas. Thank you for hosting such a great giveaway! All I want for Christmas is……a SILHOUETTE CAMEO FOR ME!!!! !